Soak gelatin in 1/2 cup water. Heat milk until hot, not boiling. Add the gelatin, sugar, vanilla and salt. Cool and add 3 cups of cream. Put in refrigerator and chill for 5-6 hours. 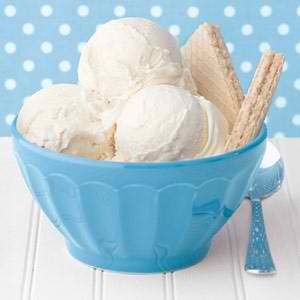 (This is a MUST for the ice cream to set up.) Pour into a one gallon ice cream freezer and freeze according to manufaturers directions.